Jenkins Honors Intramural Moot Court Competition in the Lubar Center. Marquette University Law School offers a nationally recognized moot court program in which students have many opportunities to participate throughout their entire law school careers. First-year students can get begin their involvement in Marquette University Law School’s Moot Court Program by serving as “bailiffs” for campus-based competitions throughout the year. Second- and third-year students prepare for national competitions by taking Appellate Writing and Advocacy (“AWA”) and competing in the Law School’s prestigious Jenkins Honors Intramural Moot Court Competition, which takes place during the spring semester each year. Third-year students participating in the program also have the opportunity to compete in national competitions across the country in a variety of topic areas, including criminal law, constitutional law, international law, labor and employment law, and sports law. 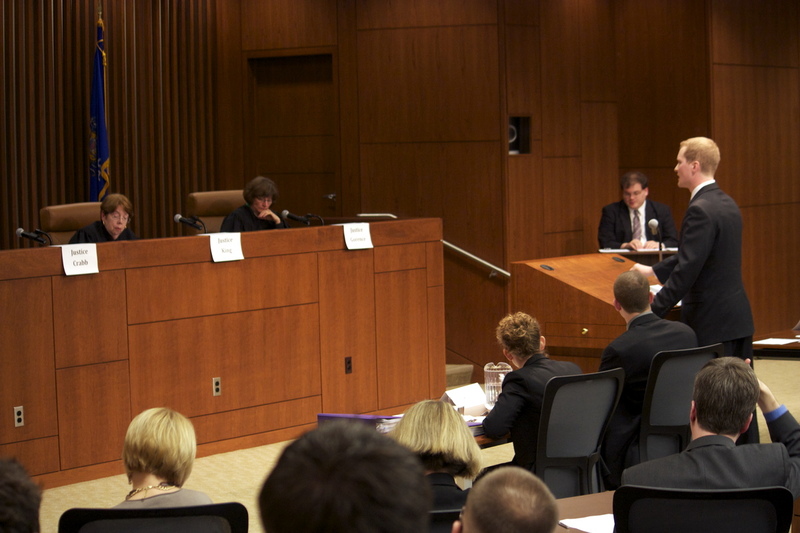 Moot court emulates the experience of what it is like to argue a case at the appellate level. In moot court, students prepare legal research, write briefs, and complete oral arguments in front of a panel of judges. It is a great way for Marquette University Law School students to experience what appellate practice is like, as well as an opportunity for them to develop and sharpen research, writing, and oral advocacy skills. First-year students interested in learning firsthand what moot court is can watch second- and third-year students compete in competitions and in the Appellate Writing and Advocacy class by bailiffing oral arguments. Bailiffing involves introducing the judges and tracking time during a round of arguments. Bailiffs play a crucial role in the oral-argument process. By serving as bailiffs, first-year students gain early exposure to the craft of presenting an upper-level oral argument and effectively addressing difficult questions posed by a panel of learned judges. Completion of the Appellate Writing and Advocacy course is a prerequisite to upper-level-student participation in the Moot Court Program. The course is open to all second- and third-year students. Second-year students interested in moot court have the chance to hone their brief writing and oral argument skills in the Appellate Writing and Advocacy course, offered each fall. The course teaches students how to handle an appeal from start to finish. Students in the course review a mock record, develop and research legal arguments, write briefs, and present oral arguments. The top students (typically 16-20) from the Appellate Writing and Advocacy course are invited to compete (in two-person teams) in the Jenkins Honors Intramural Moot Court Competition in the spring semester. After researching and preparing briefs, teams compete in an initial round-robin weekend, where they argue before a panel of judges composed of practicing attorneys and judges from the Milwaukee area. The top teams continue to advance until the final round of oral arguments, which is held in the Law School’s Lubar Center. The final argument is in front of the student body and members of the legal community. This final round is often judged by a panel of sitting federal judges, which has in the past included sitting members of U.S. Court of Appeals for the Seventh Circuit, Ninth Circuit, and the Federal Circuit. Marquette University Law School annually hosts the Region VIII Regional Round of the New York City Bar and the American College of Trial Lawyers’ National Moot Court Competition. The winners advance to the final rounds in New York City. This nationally recognized competition allows law students to hone their appellate advocacy skills by arguing before prominent members of our profession. Marquette University Law School routinely and successfully participates in a variety of national moot court competitions. During the 2018-2019 school year, MULS students will compete in eleven different competitions, including the National Moot Court Competition and the National Appellate Advocacy Competition.